Focus Select® Zinc Free is for patients whose physicians recommend a zinc-free AREDS2-based formula. Focus Select® Zinc Free utilizes the latest improvements discovered in AREDS2®, replacing beta-carotene with lutein and zeaxanthin and eliminating zinc to offer a formulation that is safe for patients wishing to avoid zinc in their supplements. Our unique formulation not only provides powerful levels of the nutrients proven to be beneficial in the study, but it is safer for smokers and reduces the risk of side effects associated with zinc. Focus Select® Zinc Free is produced in an NSF certified and FDA audited facility. As an extra measure, we conduct and approve a third-party certification of analysis for every active ingredient, on every lot, every time. 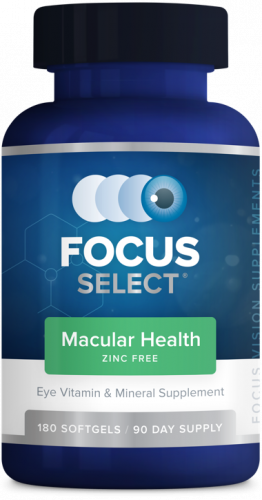 Ask your eye doctor if Focus Select® Zinc Free is the best choice for you.